Question: What do you get when you cross a railway track with a highway? Answer: A place that requires extra motorist attention to avoid a deadly encounter; and in the case of Mile 28 on Highway 16, a stretch where drivers must slow from 100 km/h to 40 km/h to cross safely. Here’s how… In Spring 2017, construction is expected to start on a new 120-metre-long bridge that will carry traffic over the CN railway line. Two kilometres of highway leading to the crossing will be re-aligned to straighten out an S-curve. At the same time, we’ll be widening driving lanes and shoulders, and doing lots of rock bolting to further boost safe travel. Plus, we’ll have more snow storage area, which lessens the possibility of winter highway closures. You`ll find fetching photos in our Flickr album too! Vehicles must slow to 40 km/h as they approach the tracks. 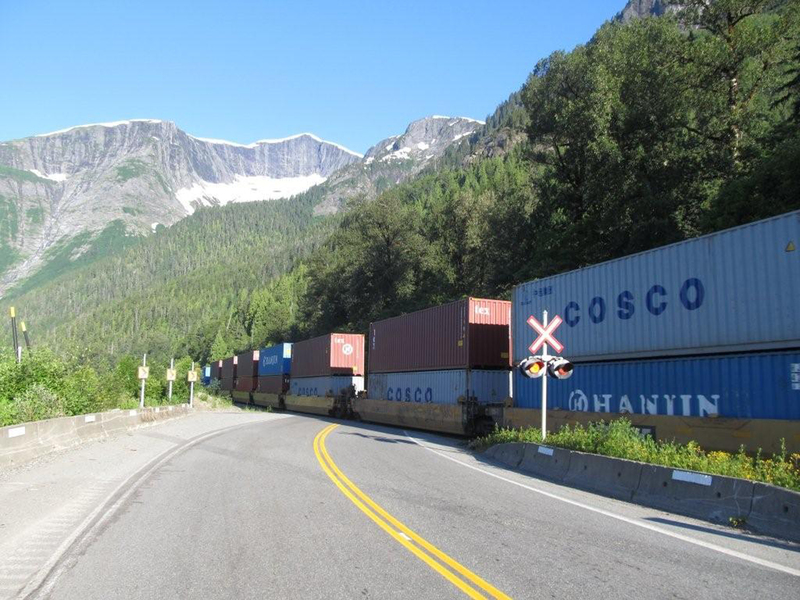 Trains carrying container freight via the Port of Prince Rupert. 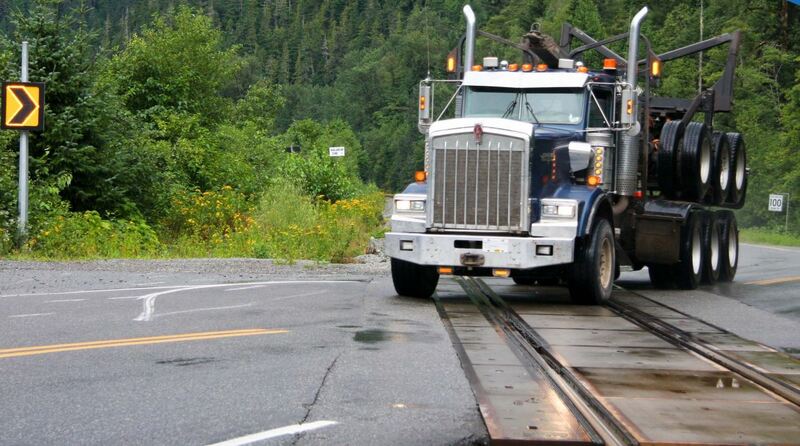 The changes will be a big boon for residents, commercial truck drivers, tourists and industrial traffic (including to and from the Port of Prince Rupert) enabling them to safely travel at the posted limit of 100 km/h (conditions permitting) along the stretch, located 45 km from Prince Rupert. Not only is the project going to improve the route for drivers, but it’s also friendly to the environment. Work will avoid rare mature and old growth forests, and minimize impacts to nesting bird areas, and mountain goat and moose winter habitat. 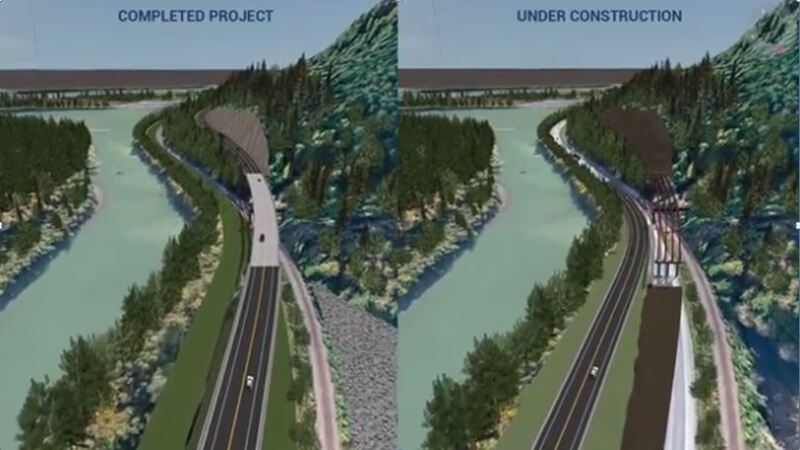 Once Highway 16 is relocated, away from the Skeena River, the original stretch will be removed and replanted. Added bonus: two culverts to increase access to fish habitat will also be built. Open houses in July 2016, and consultation with First Nations, key stakeholders, and the public have given us valuable feedback on how to manage highway traffic and access to a popular boat launch, during construction. We`ll continue to consult with them as the project unfolds. Find out more about this cost-shared project, funded by the federal and provincial governments at: www.gov.bc.ca/mile28daumontlevelcrossing. Was any consideration given to turning the old highway alignment along the Skeena River into a campsite? I’ve read it will be decommissioned, but it would make a great linear park and camping along the river is very popular. Thank you for your interest and thoughtful inquiry about turning the old highway alignment along the Skeena River, into a campground. The existing highway alignment is all within Canadian National Railway (CNR) right of way. The highway has existed under permit to CNR since it was originally constructed. The roadway will be decommissioned to CNR standards. A campground would not be a suitable use within that area, due to safety concerns. Please use areas designated for camping if staying overnight along Highway 16. Hope that this helps! thanks, that makes complete sense. I wasn’t aware that this was CN right of way, though I am aware that back in the 40’s the government more or less had to beg CN to share so a road could be built – and it was probably thanks to WWII that it ever was. I may be a bit off topic in this “Leave Reply” section of your announcement ” Highway and Track Separation Project” for Hwy 16. I could not find a web page covering the $200,000 Hwy 37 and Kitamaat Village road intersection improvements project. I have decided to post my reply here since both project locations are in the same Northwest Region under of the Ministry of Transportation and Infrastructure. Your project on the intersection of Haisla Blvd and Hwy 37A which is now in progress in Kitimat,is an improvement for traffic safety. My wife and I live two houses east on Kitamaat Village Road from the intersection in question. I assume in the planning phases of your project a vehicle count was done to justify the costs. I was wondering if pedestrian safety was considered. Many people have walked across the highway on foot at the intersection. My wife walks to and from her work at Nechako Elementry School almost every work day. Our son did when he went to elementary and secondary schools. Presently, some of our neighbour’s children are going to school crossing the highway. I understand that, at this time, the pedestrian traffic there is not as high at the ones near Lahakas /Haisla Blvd and Kuldo/Haisla Blvd that warrant traffic control lights and an overpass. As you may be aware, the development activities on a commercial property adjacent to the northeast corner of the intersection, which an up to 850 man work force camp and retail businesses are being proposed to locate there. If that materialises, which I am guessing it will when the Liquefied Natural Gas Canada (LNGC) project proceeds, that will increase the amount of traffic, both vehicle and pedestrian, dramatically. As you may have known, the Rio Tinto’s Kitimat Modernization Project completed two years ago caused increased traffic through there. Would it be prudent to be forward thinking and put in place safety features for pedestrians onto the intersection before the LNGC construction begins?